Last year’s selling season was a little bumpy but was solid through May – and then dropped off once we got into summer and rates started rising. The wait-and-see pattern kicked in as 2019 opened, but with rates having eased, we’re on our way now. 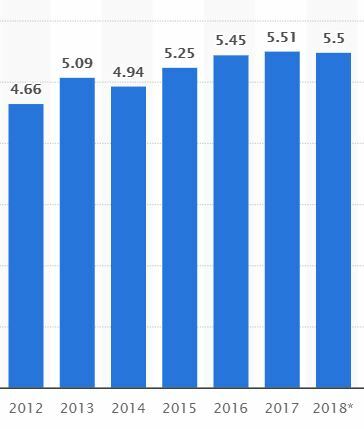 If mortgage rates will determine our fate, what can we expect for the rest of 2019? 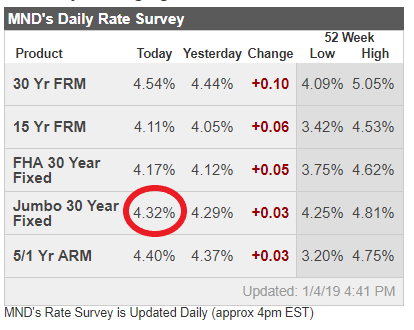 It looks like we should see mortgage rates stay in the low-4% range for now. 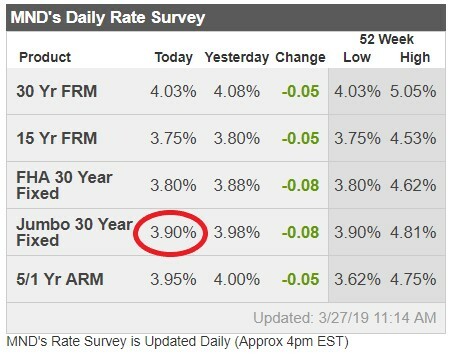 The 30-year fixed rate is typically about 1.75% above the ten-year bond yields, which today is around 2.52%. 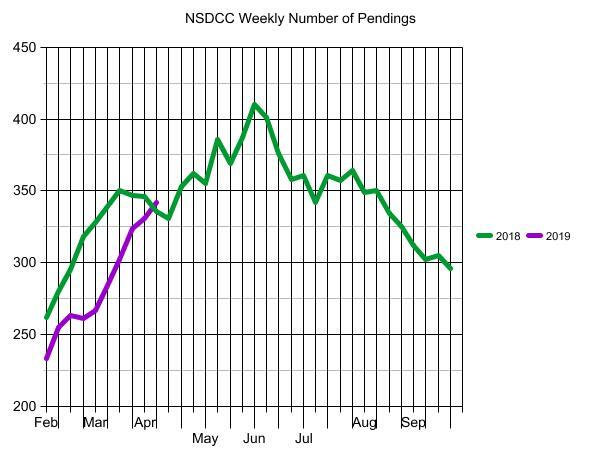 I’m going to guess that our pendings will peak again in May this year, but have a more gradual descent through the rest of 2019 than we had last year. The MLS doesn’t support analyses once the counts get too high, so I don’t have any pricing for the Over-$2M category (but should be around $1,000/sf). The number of $2M+ actives has only grown from 453 on February 25 to 472 today. There are 98 pendings too! 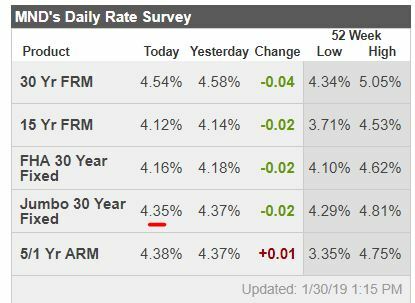 Mortgage rates spiked quickly today, capping a 3-day run leading back up from the lowest levels in more than a year. 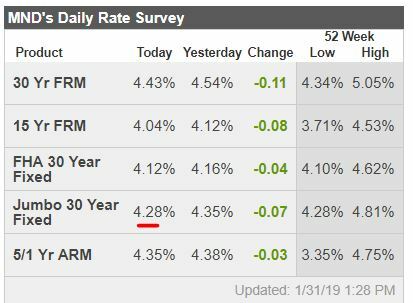 Today’s move was by far the biggest and it leaves the average lender offering rates that are at least an eighth of a percentage point (0.125%) higher compared to most of last week. Part of the reason for the size of this move is the size of the move in the other direction over the past two weeks. 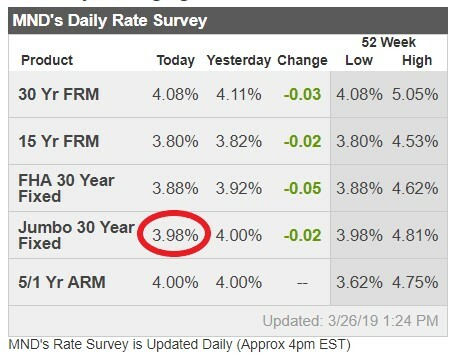 For instance, compared to 2-3 weeks ago, the average lender is quoting rates that are still an eighth of a point lower. In other words, the bigger the rally, the bigger the potential bounce. Whether or not this bounce continues may have a lot to do with the week’s remaining economic data and events. Today’s data was almost universally stronger than expected and stronger data tends to coincide with higher rates. There are important economic reports on 3 of the 4 remaining days of the week with Friday’s jobs report being the biggest consistent market mover of any economic report. Bond markets pulled back sharply today, as last week’s gains all but vanished. Stronger than predicted retail sales and manufacturing data prompted the selloff. The trend is now our enemy, time to lock those closing within 45 days. Sellers – get on the market!!!!! Mortgage rates moved lower for the 6th straight day, bringing them very close to the best levels since late 2017. Perhaps more impressive (or telling) is the fact that rates haven’t even had a single “bad day” since March 1st. It’s impressive because it’s been an incredibly long winning streak (we usually see a day here or there with rates nudging a bit higher). It’s telling because it’s exactly what you’d expect to find as the backdrop for what has been the single best month for mortgage rates in more than a decade. The past 2 weeks have acted as a forceful breakout after several months spent in an increasingly narrow range. Such breakouts often carry momentum, especiallywhen there are surprising economic updates or central bank policy at the scene of the crime (as there was with last week’s Fed announcement and European economic data). Now we’re waiting to see how low we can go. It hasn’t made sense to bet on a bounce in rates so far, but that could change soon. In general, there are only so many winning days that can be strung together before the rates market blows off a bit of steam. When that happens, it will be important to note how big the bounce is and whether it lasts more than a single day. If it simply presents itself as a single, token day of correction, rates will likely be heading even lower. It’s Really Go Time Now! The latest numbers are month-to-date, and will increase considerably with four business days to go. But the March sales will end up well under last year’s count, though the lower rates should help boost sales in April and May. Don’t be surprised if it’s a little clunky. 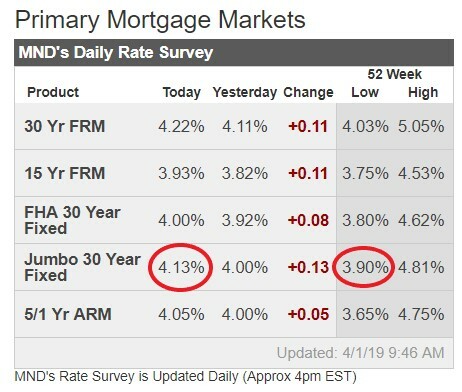 Mortgage rates are improving nicely, and at the right time of year! We should see more market surge over the next couple of weeks. It’s true that markets were already expecting a dovish Fed announcement. This created an asymmetric risk that the Fed would only be as friendly as they needed to be and that rates would have been positioned too low for such a thing. As it happened, however, the Fed was noticeably friendlier than most anyone guessed. They dropped their verbiage pertaining to additional rate hikes. 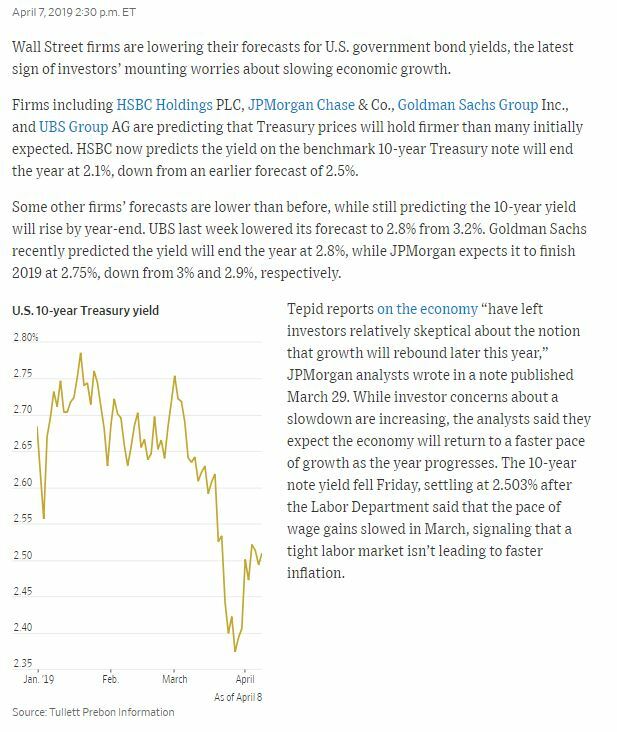 This effectively begins an era where rates will remain at current levels until economic data or other considerations motivate a change. Big news indeed! They also dropped the reference to economic risks being balanced. The only way to be any friendlier to bonds would have been to say that economic risks had tilted to the downside (which can already be inferred from this change). They also said they were prepared to adjust the balance sheet normalization policy if needed (i.e. they could start buying MBS again). Unsurprisingly, MBS liked this news and improved at a faster clip than 10yr Treasuries. Part of the 10yr’s problem was the big advantage the Fed’s announcement provided for shorter maturity Treasuries. In other words, traders were buying Treasuries, but most of the love went to the 2-5yr sector. In the bigger picture, this is just another decently-sized green day for 10yr Treasuries, but reading between the lines, there’s a bit more to like. For MBS, it was easily the best day since January 4th. Not only that, but there’s a chance we look back at this as the day the Fed confirmed the end of the rising rate environment of the past 2 years. Granted, the past 2.5 months already did quite a bit in that regard, but it’s going to take a bit more time and stability to get comfortable with that idea. Does weather affect home sales? Yes, buyers don’t mind the distraction when the market is uncertain! But now that the holidays are over, the Chargers are done, more houses are coming to market, and mortgage rates are a half-point lower than they were three months ago, we are (over)due for a surge of activity. 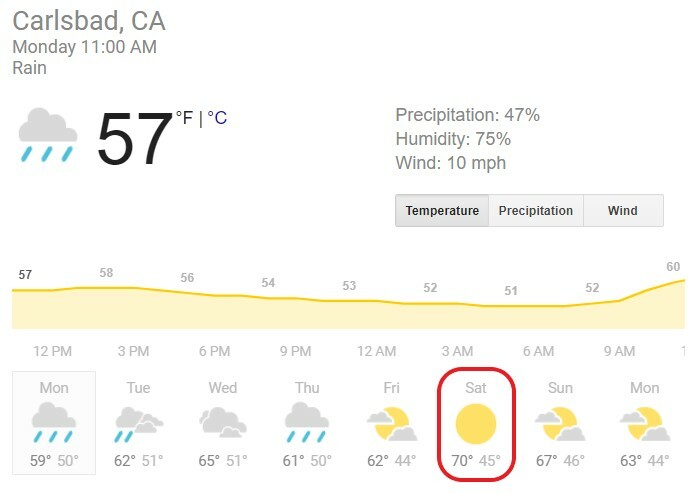 There are two big NFL games on Sunday afternoon, which leaves Saturday wide open – and it has the best weather of the week. No big games the following weekend, so if the weather holds out, buyers should be fully engaged – and if they aren’t, then that says something too. It’s hard enough just trying to sell – if you have to schedule around the weather and other conflicts (graduations, for example), it narrows down the chances even more. But if we can anticipate opportunities, let’s take advantage. What’s Needed to Boost Sales? What’s it going to take to get the real estate market going? You could say that sales and pricing were at full speed between 2013 and 2017. What’s the common denominator? 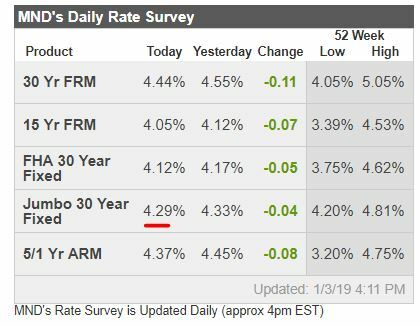 Low mortgage rates. In the graph above, it’s apparent there’s been rate-tolerance up to the 4.2% range over the last few years – which had to fuel home sales. The times when rates have risen over 4.2%, they retreated quickly – except in early 2018. Once we got into the second half of last year and rates had risen into the high-4s, the housing market stalled out. 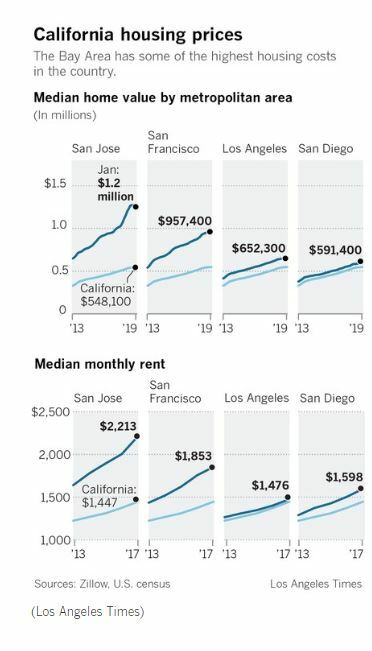 A jittery stock market could help housing if people take money off the table, and diversify (which is code for Help the Kids With Their Down Payment). 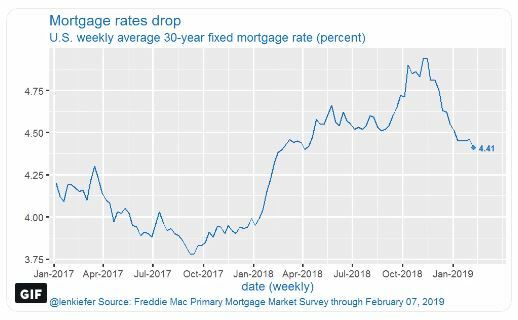 Are mortgage rates going to go down further? We can’t count on any help coming from the Fed, the stock market, Trump, Congress, AOC, etc. – we’re going to have to handle it ourselves. Whoever can solve the mortgage-rate riddle, and get them under 4.2% – or because of the other turbulence, under 4.0%, should win the game. 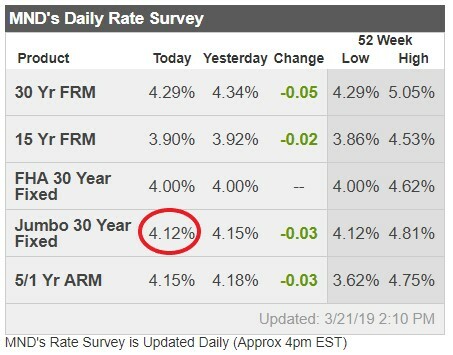 Mortgage rates have come down nicely – let’s hope they stick! Higher rates are what keep buyers on the couch. When they see rates go up, they expect sellers to lower their prices to compensate. 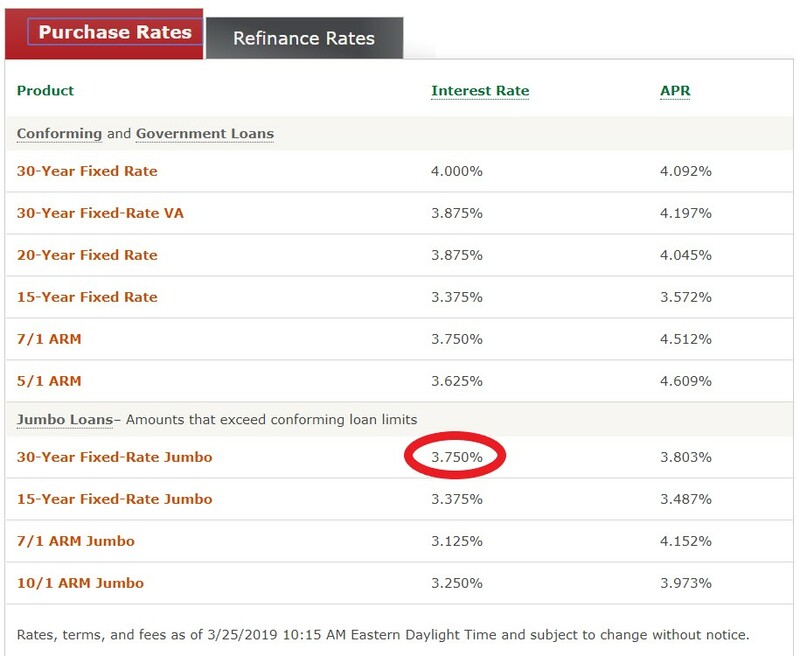 But if we can get rates back into the low four-percent range, or gasp, maybe under four percent (with some buydown), it might cool off the buyers’ demand for an offset. The extra drama isn’t good for anyone. If we can keep the focus on just one single thing – the price – we’ll be fine. I think sellers are willing to be reasonable, it’s just a matter of when. If you’re getting offers, your list price is about right. If you are getting visitors, but no offers, then your price is 5% to 10% wrong – or yours is being shown to help sell the better-priced home down the street. If you have no showings, your list price is more than 10% wrong. Once we’re past the holidays and rates get reasonable, we’re out of excuses!